Intel showed its mobile ambitions at MWC 2014 by launching a new processor range called Merrifield and a variant called Moorefield. Two stock keeping units (SKUs, or versions of the chip) will be available, the Z3480 and the Z3580. Both replace the Clover Trail+ platform as the company's flagship mobile platform and are 64-bit compatible. Clover Trail+ had limited prospects in a crowded mobile market going up against competing processors in the form of the Lenovo's K900, and others from the likes of Samsung, Asus and Dell. Merrifield uses a smaller node at 22nm (compared to 32nm), meaning it should use less power and extend the battery life of any device it finds itself in. 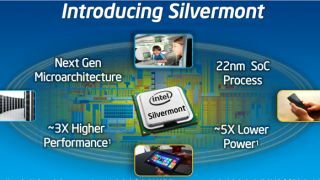 The dual-core Z3480 SoC (system-on-a-chip) can reach clock speeds of up to 2.13GHz with 1MB shared L2 cache while implementing what it calls a "new micro architecture with OOO execution" called Silvermont. It comes with the LTE-capable XMM 7160 baseband modem that can reach download speeds of up to 150Mbps. Intel added the much sought-after support for up to 4GB LPDDR3 memory, a move that will drastically improve performance and reduce power consumption on Merrifield devices. Graphics is another sub-system that gets a significant boost with an upgrade to a quad cluster PowerVR G6400 GPU (AKA Rogue), similar to what lies inside the Apple A7 SoC on the iPhone 5S. That upgrade allows the new platform to deliver up to twice the graphics performance compared to the previous generation. Also in the mix are a next-generation image signal processor as well as a dedicated programmable video signal processor that can encode and decode at 1080p (and 60 frames per second). The higher-end SKU, the Z3580, also known as Moorefield, adds two extra cores, bumps the clock speed to 2.3GHz, adds support for 800MHz LDPDDR3 memory and swaps the G6400 GPU for the G6430. Another worthy addition is Intel's integrated sensor solution - a low-power hardware subsystem that allows the SoC to deliver contextual information to apps without the need for additional hardware. The company mentions motion and gesture sensing, audio sensing, location sensing and contextual analyses, and examples of potential apps include life visualisation, device personalisation and predictive assistant. Intel also announced a new LTE chip at MWC, the XMM 7260, one that supports download speeds of up to 300Mbps.